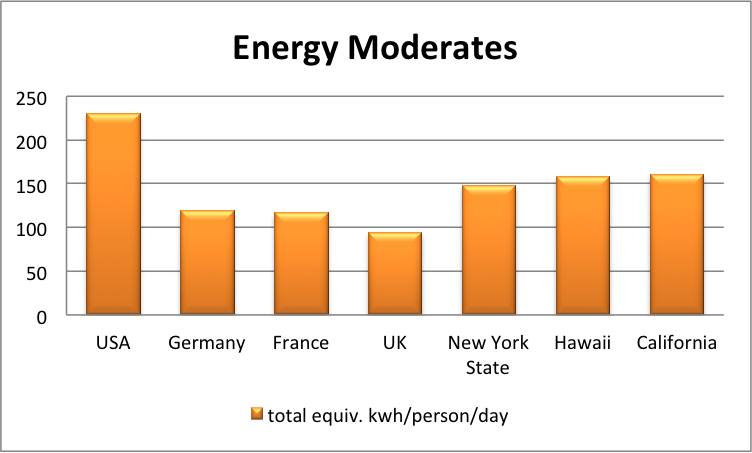 Is 230 kwh/person/day a lot or a little? How do we compare to other countries? As you can see, we use nearly double the amount of per capita energy as Germany and France, and nearly 2 ½ times the energy per capita of the UK. How can this be? Those of us who have visited Germany, France and the UK can testify that they have cold winters, warm summers, and that their citizens seem to enjoy a high standard of living. 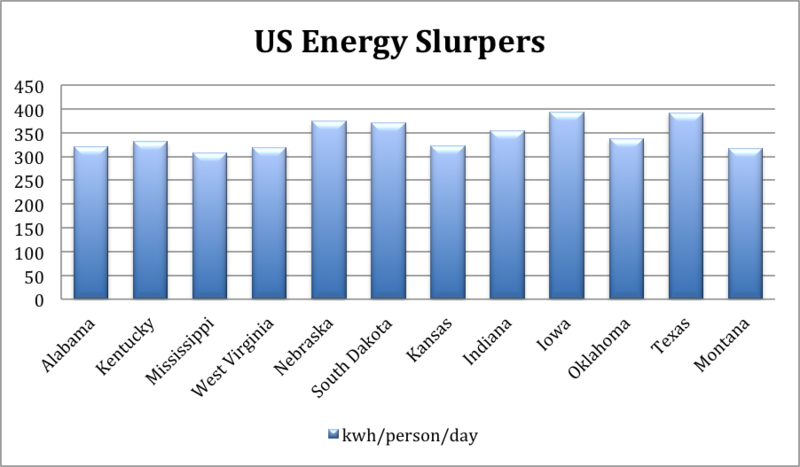 For comparison, I’ve included a few of the most energy-sipping US states. Let’s compare the US to some other countries. Ones that have snow. These countries on most measures offer their citizens a higher standard of living while using 3/4ths to 1/2 the energy per person that we use. 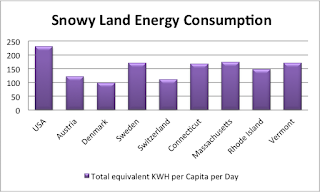 I've compared them to our most energy efficient snowy-land states. Rhode Island manages to beat Sweden, anyway. 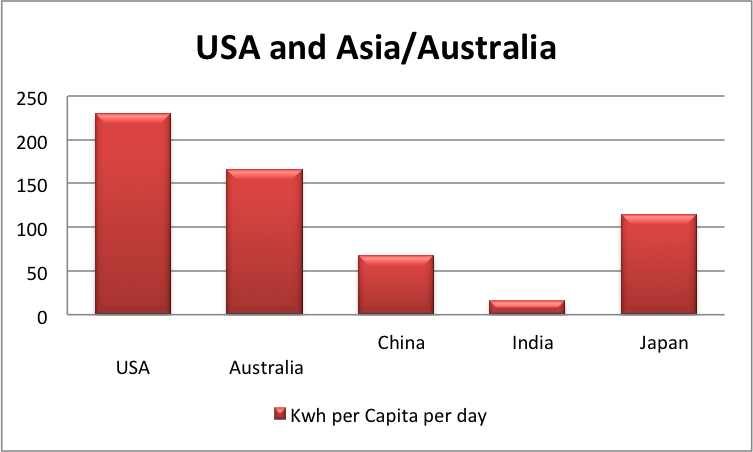 Here we compare the US to key Asian countries (plus Australia). 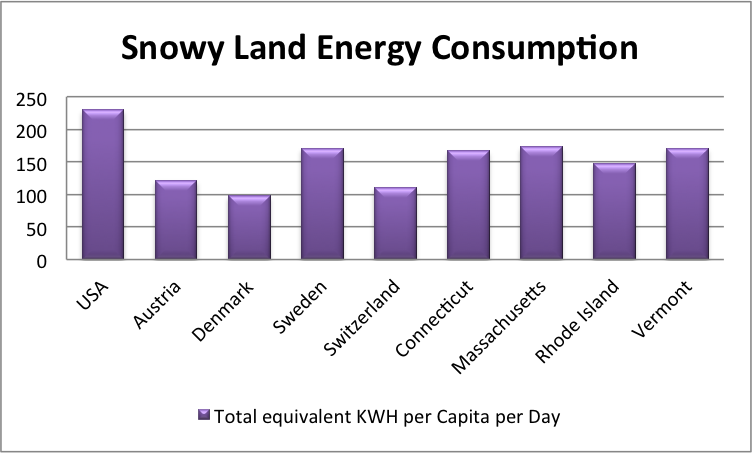 A number of other states, while not energy sumo wrestles, are still obese when it comes to kwh/person/day and some outdo even Kuwait, as you can see in the chart below. It’s interesting to note that even countries that are highly energy efficient have room to improve because they all still use substantial fossil fuels for transportation and/or space heating. While electricity at present provides only 16% of US total energy consumption, even the most electrified countries in the world don’t break 30%. 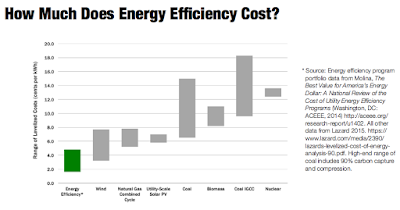 The reason electrification is important is that in terms of wringing the most benefit from every kilowatt-hour expended, electricity is the way to go. Electric motors turn 60% of the energy fed to them into power at the wheels whereas gasoline engines convert only 20%. (Diesel motors convert 35 – 40%.) An air source heat pump is three times as efficient as the most efficient natural gas furnace; a ground source heat pump is six times as efficient. A heat pump hot water heater is generally four times as efficient as a gas one. And a desuperheater connected to a ground source heat pump will turn waste heat into hot water all summer with almost no additional energy at all. 23 kwh residential, 20 kwh commercial, 35 kwh industrial and 22 kwh transportation. Right now 30 out of 51 kwh/person/day of residential energy is used towards space and water heating. With a combination of heat pumps, better sealing and insulation, solar hot water, energy exchange ventilators, and ceiling fans, we can drop total residential energy down to 26 kwh/person/day. Put in all LED lightbulbs and efficient appliances (and a few other items I'll mention in Part II) and we can drop it down to 21 kwh/person/day, below our future energy budget. For transportation, less than 1 kwh/person/day comes from electricity, making it a key area in need of change. As you can see below electric forms of transportation are substantially more energy efficient than those powered by internal combustion engines. Note: Around town bicycling and walking kwh/mile rates are calculated based on calories burned above baseline human metabolism (45 additional calories/mile walking and 32 additional calories per mile biking.) Transit, train and air travel calculated with 80% passenger load. Electric bike rate includes relaxed pedaling. Amtrak is a combination of diesel trains and all-electric. On average Americans travel 13,183 miles per person in a year. By private car (with average MPG and average occupancy) this amount of travel works out to 37 kwh/day. Way over the transport budget. 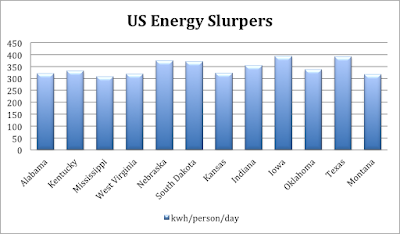 If we drop travel miles by a fourth to 9900 miles/year (by a larger portion of us telecommuting and by most of us living closer to work, goods and services), that gets us to 27 kwh/person/day. This is still over the transport budget, and it doesn't include freight miles traveled. But if 2000 of those miles were by high speed rail, 3000 by transit, 2000 by air, 1900 by electric car (or rideshare) and 1000 by walking and biking, that squeezes down to 9 kwh/person/day. Now let's look at freight. For each person in the US, 55 tons of domestic freight are moved an average of 325 mi. By diesel truck that comes to 58 kwh/day (and that doesn't include ocean shipping if it's an import.) Say we could cut this in half by buying local, by not buying stuff we don't need, by drinking filtered tap water instead of bottled water or soda, and by ending coal and oil shipments. That puts us at 29 kwh/day, still way above the travel budget. 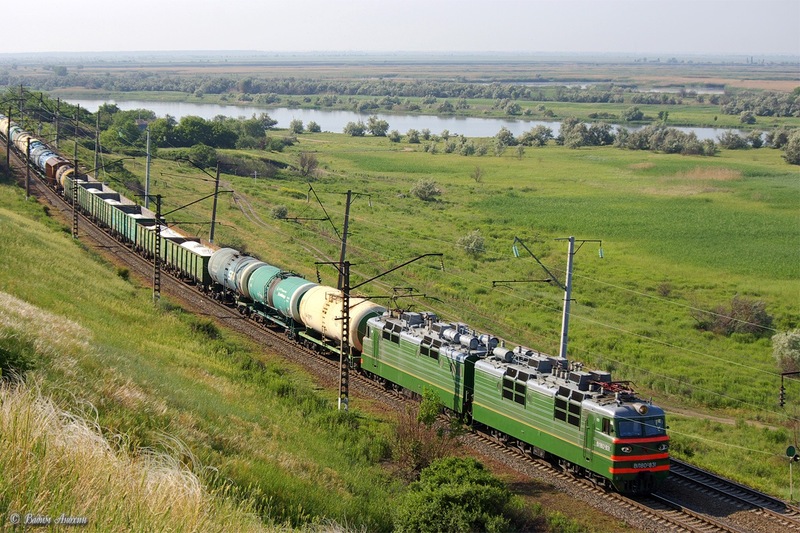 However, if we use diesel electric trains, each person's freight movement only comes to 2.5 kwh/day. If we use electric trains it gets down to .75-1.5 kwh/day, leaving a lot more room in the energy budget for passenger travel. No doubt with trains we'd have to add on a couple kwhs for the last 1 - 20 miles of delivery by electric truck, and international freight and water transport have to folded in here somehow, but all of the sudden 20 kwh/person/day for total transportation looks a lot more manageable. 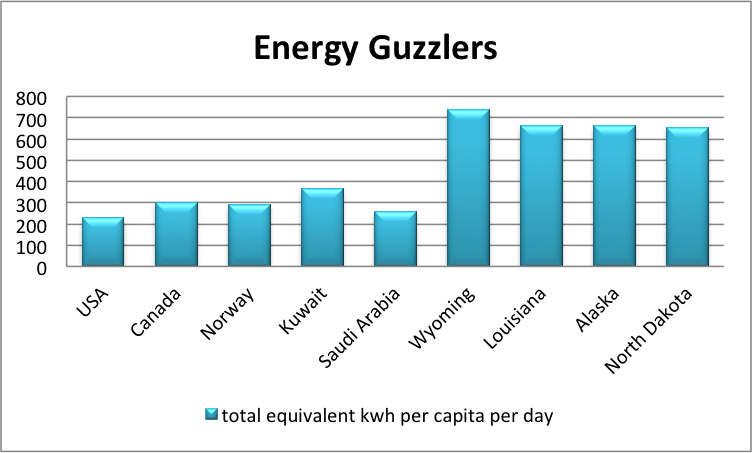 As far as industry goes, Part II goes into this further, but for now I'll just point out that oil refining in the US uses 15 kwh/person/day. Get transportation off oil, and industrial energy use instantly drops from 73 to 58 kwh/person/day from refining alone. If we insist on slurping up energy at current levels, even with extraordinary measures it might take us fifty years to stop spewing emissions, and that will be too late to prevent permafrost detonation. But if we can get by comfortably with 100 kwh/person/day, that’s a much easier target to meet, one we can probably achieve in 20 years. Not only is this a target we can achieve faster, it’s a target we can achieve more cheaply. 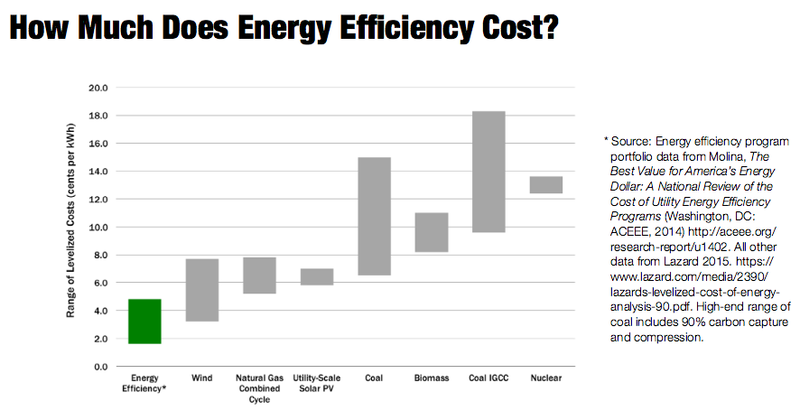 That’s because energy efficiency is absolutely the most economical form of energy production available to us. While the cost of solar and wind will no doubt drop even more over time, in 2015 the US produced only 5 kwh/person/day of electricity from renewables (including rooftop solar) + hydro. Which means to get carbon-free we have a long ways to go. Even if we start building out solar PV and wind at 20 times the rate of 2012 (our best year ever), we won't be able to produce enough carbon-free energy fast enough to prevent catastrophe. But if we combine a rapid build out of renewables with a rapid lowering of demand through common sense behaviors and technology that already exists, we have a fighting chance. Find out how to do this and more in Part II! Note: Most data in this post is from the 2015 BP Statistical Review of World Energy, probably the best compendium of world energy available, and from the US Energy Information Agency, the best source for state-level data. The per person per day energy figures include all large-scale sources of energy such as oil, natural gas, coal, nuclear power, hydro and renewables, their equivalent energy content turned into kilowatt-hours. They do not include rooftop PV or wood for heating or cooking, or energy expended to walk or bike for transportation. They do include all uses—residential, commercial, industrial, and transportation. 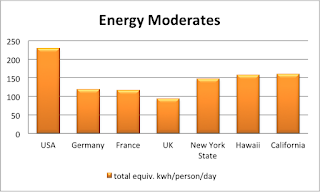 Because our future will be mostly all electric, I’ve used kilowatt-hours as the energy unit of choice, better, in my opinion, than Tons of Oil Equivalent or BTU’s, although I acknowledge there’s a good case to be made for joules.